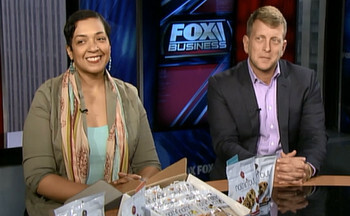 I’m Jerri Graham, the founding partner of Nothin’ But Premium Foods. I started Nothin’ But after realizing that way too many of the snack bars on the market were lacking the level of taste, texture, and ingredients that I wanted to eat, let alone give to my daughter. Everything was either loaded with artificial protein powders or a “log” of foodstuff that left much to be desired. So, I started making bars that I wanted to eat, give to my friends, and most imporantly what I wanted to feed my own child. I began selling them to local cafes, farmer’s markets, and gyms. People loved them and wanted more, but I could only do so much on my own. While my capacity was limited, my dream wasn’t. I knew that other people wanted something more in their snacks and Nothin’ But was the answer. But, I couldn’t do it alone. Then one fateful day, I received a phone call from Steven Laitmon. A businessman with a successful staffing firm and great taste (of course I’ll say that), Steven purchased a bar at the suggestion of his wife Nathalie, ate a couple of bites and gave me a call. From our first conversation, we knew that we were on the same page. We were both tired of the junk that was out there passing itself off as good. Our first meeting was a whirlwind of ideas, flavor combinations, and future products that could barely be contained within a lifetime, let alone a lunch meeting. The rest is Granola History.